The Super Ball was invented and patented in 1964 by chemist Norman Stingley. The ball is made of a synthetic material he called Zectron, using a polymer polybutadiene and other materials, a form of artificial rubber. It was sold to toy stores by the Wham-O company and was, for a while in the 60s, a great fad. The NFL decided to call its championship game the "Super Bowl" because a sports executive blurted out the name during a meeting, likely inspired by this favorite toy of his children. Almost 50 years later, it is still sold by Wham-O and it is possible to imagine that many of those sales go to physicists and physics students. A Google Scholar search of "Super ball" returned 460,000 entries, including scientific papers, poster presentations, dissertations, and books. Bouncing Super Balls has become a standard physics demonstration, Cross said, and the papers are crammed with formulas, charts, and drawings. 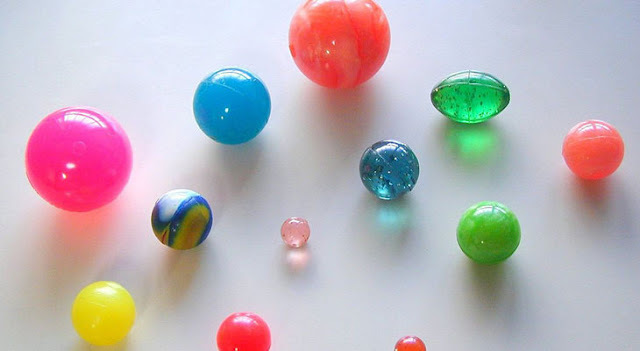 What entrances scientists is how well the balls bounce, an ability described in jargon as the coefficient of restitution, which depends on the elasticity of the surface. The Super Ball is almost perfectly elastic in both the horizontal and vertical directions. The Super Ball has an almost perfect coefficient of restitution and does things other balls do not. Baseballs, for example, hardly bounce at all. Tennis balls bounce better, but they are limited by the rules of the game. Under those rules a tennis ball dropped from 100 inches can bounce no higher than 58 inches, just more than half. Golf balls have a much higher coefficient of resolution because under their plastic skin resides a small, slightly harder, Super Ball. Part of a Super Ball’s uniqueness is its ability to bounce in all directions equally. If you shoot a Super Ball obliquely at the ground with an angle of 20 degrees, it will bounce out at the same 20 degree angle. In his study Cross aimed a Super Ball obliquely at a horizontal blackboard which he covered with chalk lines to show what happens when the ball hits the surface. He videotaped the event at 300 frames per second. The ball lost only a little velocity, meaning the Super Ball conserved almost all its kinetic energy, and what kinetic energy it lost was converted to heat, raising the ball's temperature about a quarter of one degree Celsius. In the blackboard experiment he was also able to demonstrate a little-known fact about all rolling balls: At one point when a ball rolls forward, the bottom comes to a standstill while the ball is still moving. On a rolling ball, the top of the ball spins forward while the bottom of the ball spins backwards, a phenomenon caused by friction with the surface. Because Super Balls have rough exteriors, the effect of friction is pronounced. For example, if you dropped a Super Ball from the top of the Empire State Building, it would only bounce seven stories high because wind friction would lower the ball's terminal velocity. It wouldn't be going very fast when it hit the pavement. For a brief moment, while the ball is still rolling forward, the bottom is moving backwards with respect to the center. Since the whole ball itself is moving forward, that means the bottom "is actually at rest on the surface relative to the center," he said. "Physicists understand this. It confuses physics students," he said. Throwing a Super Ball with a backspin between two horizontal surfaces, such as the floor under a table, produces several bounces during which the ball reverses spin and direction with each bounce. Eventually, it bounces back to the hand that threw it. The Super Ball picks up spin from the friction of the roll on the first surface it hits. The second surface reverses the spin by the same process, according to Michael Vollmer, professor of experimental physics at the Brandenburg University of Applied Sciences, in Germany, who has used high-speed cameras to record what happens. The use of modern, inexpensive high-speed cameras has made demonstrating all this to students much easier, said Vollmer. "In the last two years, we have developed a series of teacher-training seminars dealing with high speed imaging, which were successfully tested in Switzerland, Austria, and Germany," he wrote. His team also produced videos of exploding balloons, karate hits, deformed balls, strange reflections, and breaking rods (spaghetti). Why bother with something as trivial as watching a ball bounce? "As a physicist, if I say something they [students] don't understand, I feel happy if at the end of the day they can understand it," said Cross. Alot of children loved super balls. Because its bounce very well. Nice blog Visit my site .